For other uses, see Jewish War. The Jewish War or Judean War (in full Flavius Josephus's Books of the History of the Jewish War against the Romans, Greek: Φλαυίου Ἰωσήπου ἱστορία Ἰουδαϊκοῦ πολέμου πρὸς Ῥωμαίους βιβλία, Phlauiou Iōsēpou historia Ioudaikou polemou pros Rōmaious biblia), also referred to in English as The Wars of the Jews, is a book written by Josephus, a Roman-Jewish historian of the 1st century. Divided into seven books, it opens with a summary of Jewish history from the capture of Jerusalem by the Seleucid ruler Antiochus IV Epiphanes in 168 BC to the first stages of the First Jewish–Roman War (Book I and II). The next five books detail the unfolding of the war, under Roman generals Vespasian and Titus, to the death of the last Sicarii. The book was written about 75 AD, originally in Josephus's "paternal tongue" – either Aramaic or Hebrew – though this version has not survived. It was later translated into Greek, probably under the supervision of Josephus himself. Buth and Pierce wrote "the current Greek edition does not appear to be a translation, but must be considered a new edition, a complete re-working of the first writing and likely a considerable expansion." The sources of the First Jewish–Roman War are: this account of Josephus, the Talmud (Gittin 57b), Midrash Eichah, and the Hebrew inscriptions on the Jewish coins minted, and Book V of Tacitus' Histories. The text also survives in an Old Slavonic version, as well as Hebrew which contains material not found in the Greek version, and which is lacking other material found in the Greek version. ^ Flavius Josephus: Translation and Commentary. Judean war, Flavius Josephus, Steve Mason, Honora Chapman. Books.google.co.uk. Retrieved 2013-07-20. ^ The Sicarii in Josephus's Judean War, Mark Andrew Brighton. Books.google.co.uk. Retrieved 2013-07-20. ^ Palestine in the Time of Jesus: Social Structures and Social Conflicts, K. C. Hanson, Douglas E. Oakman. Books.google.co.uk. Retrieved 2013-07-20. ^ "See". Classics.mit.edu. Retrieved 2013-07-20. ^ Christopher M. Weimer. 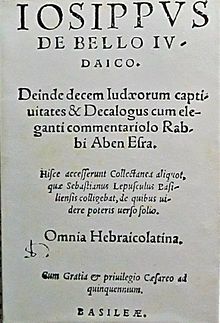 "The Slavonic Josephus' Account Of The Baptist And Jesus". Gnosis.org. Retrieved 2013-07-20. The Jewish War: Revised Edition. ISBN 0-14-044420-3. H. Leeming and K. Leeming: Josephus' "Jewish War" and Its Slavonic Version: A Synoptic Comparison. Ancient Judaism & Early Christianity, Brill (1999). ISBN 90-04-11438-6. Wikimedia Commons has media related to Jewish War. The Wars of the Jews at the Perseus Project. Hear a discussion and analysis of this monograph, on an episode of the radio series Invitation to Learning.